Franklin County's fifth World's Record will travel Vermont this summer. Cultural Heritage Days continue in Vermont through July Fourth. Sunday was Palettes of Vermont Day at Bay Day, July 2, in the St. Albans Town Park at St. Albans Bay. The World's Largest Palette, created by the All Arts Council, St. Albans for the Future, and professional and community artists from Franklin County, did stand out on the grounds. The Palettes of Franklin County, Vermont were on display in the Stone Bathhouse from 10 a.m. through the fireworks. 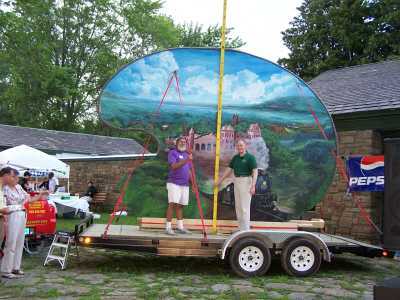 Governor Jim Douglas attended the first official measuring ceremony for the World's Largest Palette. 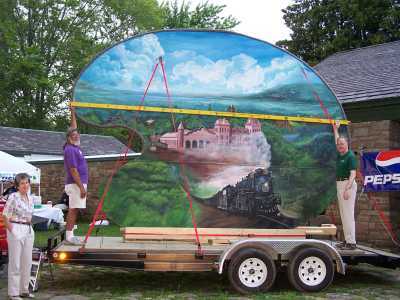 He used the Not Quite World's Largest Yard Stick" and found that the length of the World's Largest Palette is approximately 16 feet and the width of the World's Largest Palette is approximately 12 feet. "I proclaim that this is a wonderful community effort for the state of Vermont," Governor Douglas said. "The All Arts Council of Franklin County and St Albans for the Future have created World's Largest Palette." The Town of St. Albans and the All Arts Council also offered live music all afternoon on the stage. "The family events also included sports, balloon rides, and more," St. Albans Town Parks and Recreation Director Glenn Pion said. 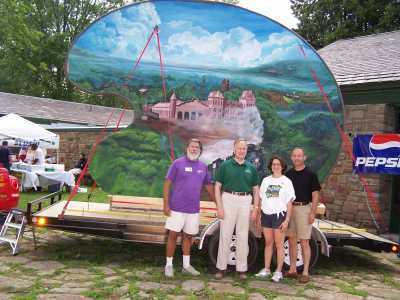 The World's Largest Palette is sponsored by the Peoples Trust Company, R. J. Fournier, Sticks and Stuff, and Union Bank. It is a project of the All Arts Council and St Albans for the Future. The statewide project is sponsored by Chittenden Bank, Casella Waste Systems, and National Endowment on the Arts, Times Argus, NRG Systems, VermontVacation.com, and Vermont Wood Manufacturers Association, with promotional support from the Vermont Department of Tourism and Marketing. The local project is sponsored by the All Arts Council and St Albans for the Future with considerable assistance from community partners including BFA-St. Albans, Rene J. Fournier Farm Equipment, Franklin County Regional Chamber of Commerce, New England Central Railroad, People's Trust Company, the St. Albans Historical Museum, Sticks & Stuff, and Union Bank.